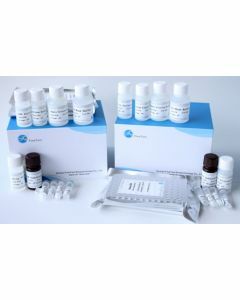 SULT2B1, 1-365aa, Human, 01-1804-1 | ARP American Research Products, Inc.
Sulfotransferase family cytosolic 2B member 1 isoform b, also known as SULT2B1, is a member of Sulfotransferase family. Sulfotransferase enzymes catalyze the sulfate conjugation of many hormones, neurotransmitters, drugs, and xenobiotic compounds. These cytosolic enzymes are different in their tissue distributions and substrate specificities. SULT2B1b is localized in the cytosol and nuclei of human cells. SULT2B1b is selective for the sulfation of 3beta-hydroxysteroids such as dehydroepiandrosterone and pregnenolone, and may also have a role in cholesterol sulfation in human skin. Recombinant human SULT2B1, fused to His-tag at N-terminus, was expressed in E.coli and purified by using conventional chromatography techniques. HSST2, ST2B1, Sulfotransferase family cytosolic 2B member 1 isoform b Alcohol sulfotransferase, EC 2.8.2.2, Hydroxysteroid sulfotransferase 2, Sulfotransferase 2B1, Sulfotransferase family cytosolic 2B member 1, SULT2B1a, SULT2B1b. Dumas NA., et al. (2008) J Steroid Biochem Mol Biol. 111:171-7. He D., et al. (2005) Biolchim Biophys Acta. 1724:11-26.